Green living doesn’t mean you have to start a composting pile, brew your own kombucha and live a zero waste lifestyle (although all awesome ideas if that is your thing!) 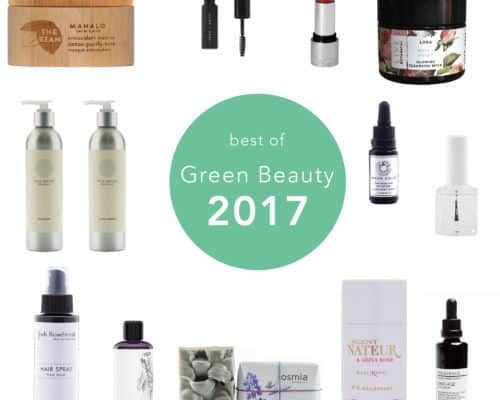 There are so many little things we can do to support the shift towards organic, nontoxic, green, eco-conscious, sustainable, low-carbon, fair trade, cruelty-free living. All it takes is awareness and some safer options. Here are a few things I’ve been trying and digging and each one of them making my life a little greener. If you are just getting into a nontoxic lifestyle, I just want to emphasize it is all about baby steps. 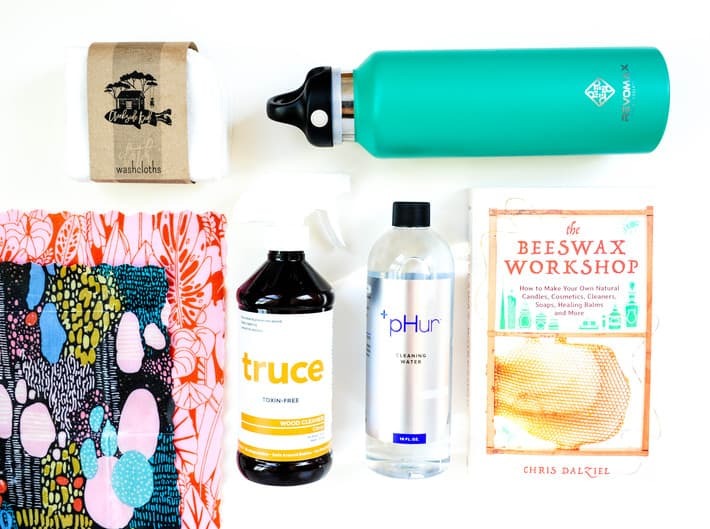 Even something as *small* as picking up a reusable water bottle can really make a huge impact on the health of our planet. Don’t underestimate your efforts, your choices make a difference! Talk about a fantastic swap for plastic wrap! These wraps are made with organic cotton, beeswax, tree resin and plant oils to create a natural antibacterial wrap that can be reused for up to a year! These are very similar to Bee’s Wrap but I did notice a few key differences. 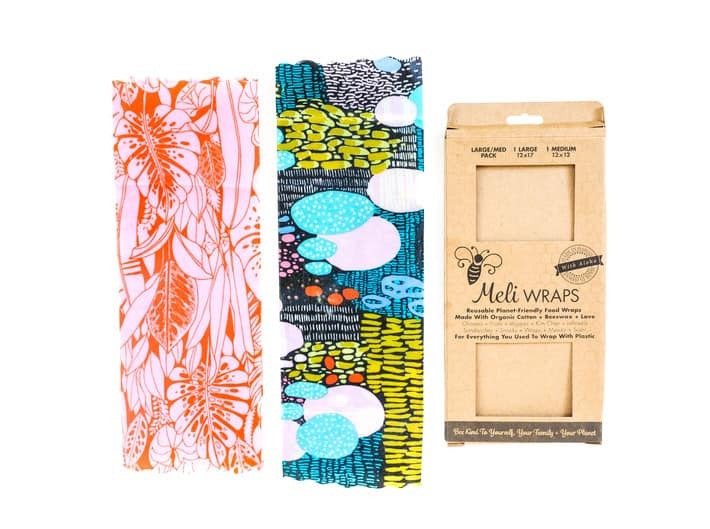 I found the strength of the Meli Wraps to be a little bit more formidable – however this could be because I am just breaking them in whereas my Bee’s Wrap ones have been used a zill. The large size (12×17) is also way bigger than the Bee’s Wrap large (13×14) and better suited for larger bowls and items. And Meli offers a cuter and wider range of pattern selection – in my opinion. These wraps mold with the heat of your hands and then firm back up when you put them in the fridge. They are great for covering most types of dishes, wrapping a wedge of cheese, leftovers, a sandwich or a bunch of fresh greens from the farmers market. Plus love the cuteness it adds to the shelves of my fridge. Shop Meli Wraps and use code ORGANIC20 for 20% off! 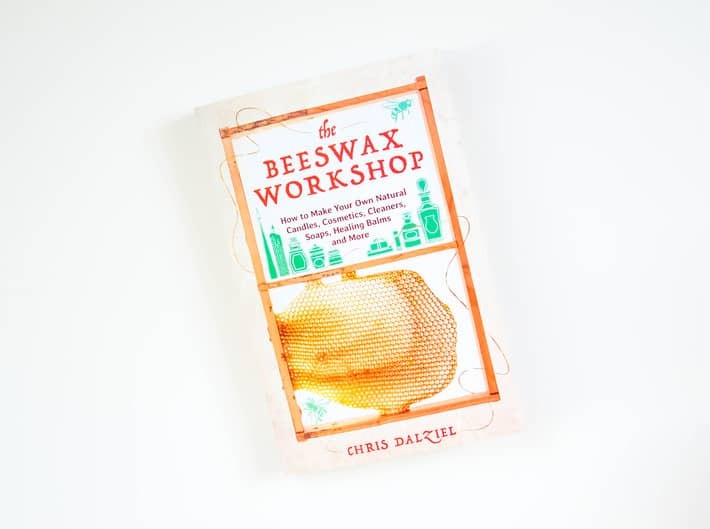 Speaking of beeswax wraps, how about making your own!? I am totally LOVING this DIY book. 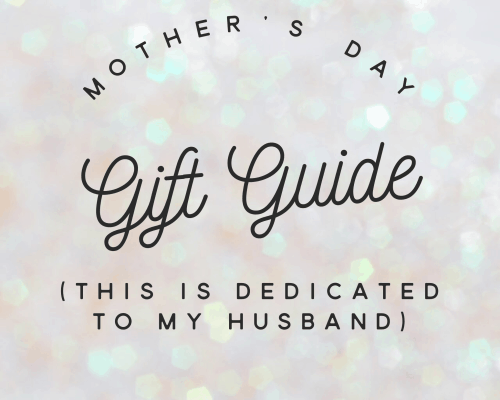 Presenting over 100 projects, it is chalk full of recipes for all things beeswax from mason jar candles, furniture polish, wood sealants, body butters, magnesium lotion and lip glosses to a sunburn salve, a soap recipe and a waterproof shade hat! Yeah, you read that right, a beeswax hat! I am so pumped to try the beeswax wraps recipe (and more)! 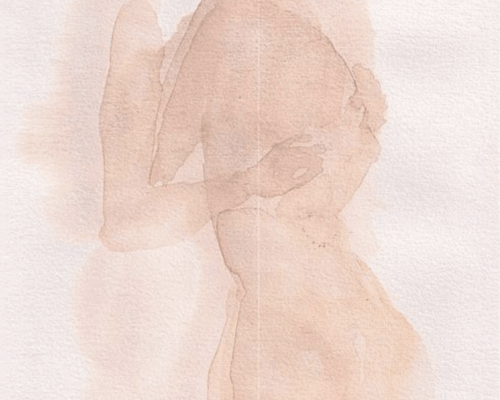 This project calls for beeswax, pine resin, jojoba oil and 100% cotton muslin fabric – and I think I have everything except the pine resin. Who wants to come over!? Switching to DIY projects is less toxic for the home and the environment because it eliminates harsh chemicals and modern day ingredients like parabens, triclosan, PEGS, toxic fragrances and more. I say, let the DIY-ing commence! Grab your copy on Amazon! How many times has your water bottle spilled in your bag? If you are anything like me it is one too many times! So annoying! Anyways, this cap has proven to be a functional godsend. To insert the cap you place the cap inside the bottle opening and pull up on the cap’s finger trigger creating a waterproof seal. Then to release the cap you push the two side buttons and additional button on top of the cap to release. Sounds cumbersome in writing but ergonomically it works. The body of these flasks are made with 18/8 food-grade stainless steel. 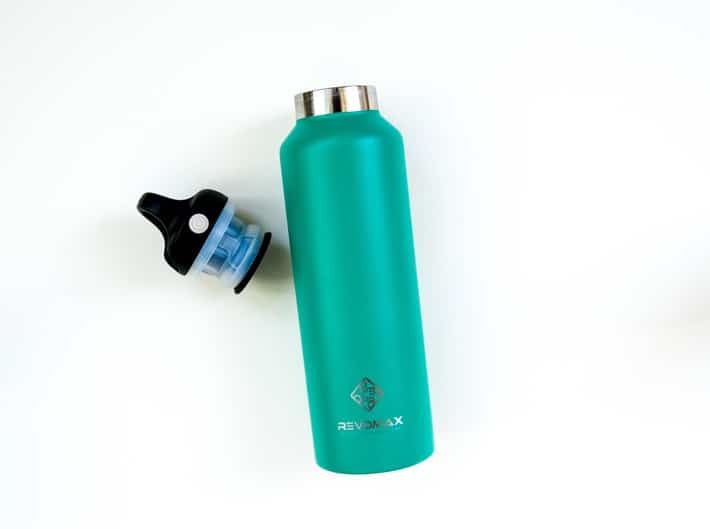 The top is a silicon rubber seal housed in a BPA-free and Phthalate-free plastic outer. Fits into the cup holder of my car and because it’s insulated, it keeps hot drinks hot and cold drinks cold. Love having this water bottle in the mix! Amazon has Revomax water bottles too! 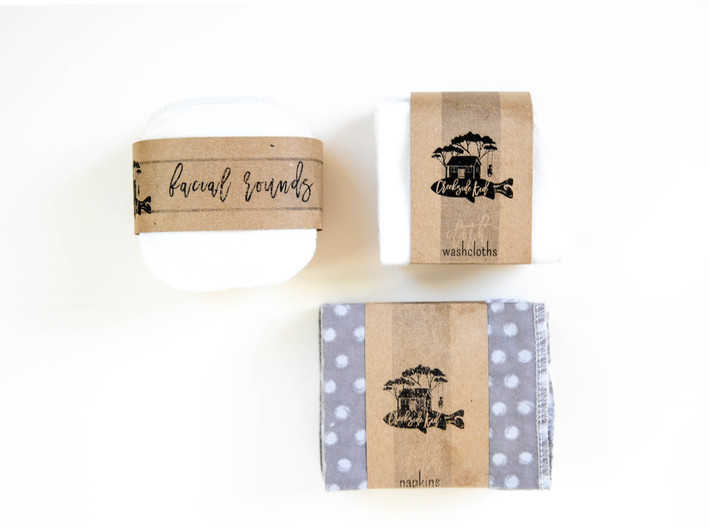 The Creekside Kid has an Etsy shop stacked with reusable cloth wipes including their unpaper towels, facial rounds, cloth wipes, napkins and nursing pads. They sent me their organic facial rounds, organic facial wash clothes and organic kids napkins to try. The big selling point here is quality and girth. I’ve tried reusable rounds and cloths before but so often they ball up after one wash then get lost in the laundry or are just too curled up to really get a good experience with them after the first time around. Well get ready because The Creekside Kid’s organic bamboo fleece and organic cotton thread weave is super thick, durable, strong and soft. It creates a sustainable experience wash after wash without any functional compromise. Check our The Creekside Kid’s Etsy Shop here! I get asked a lot what I use for cleaning supplies. 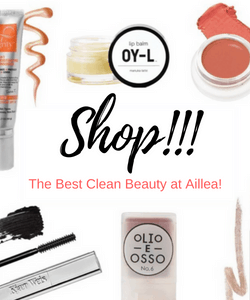 I typically use a combination of DIY solutions, castile soap and some smaller label products although I am always on the hunt for a good stain remover – and I love checking out what’s new on the green market! 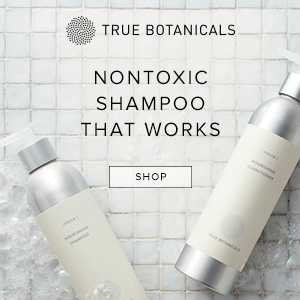 Both Truce and pHur recently sent me some of their product to try and I found a few faves. 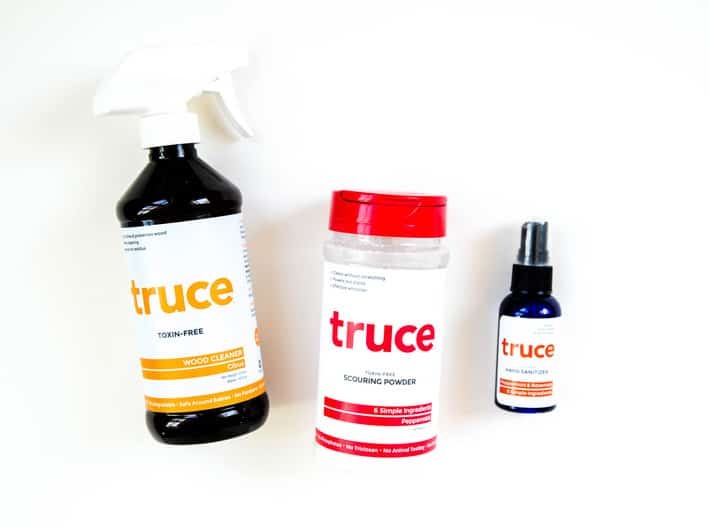 Truce sent me their Wood Cleaner, Scouring Powder, Hand Sanitizer and their All-Purpose Cleaner to test out. Gotta say, right off the bat I was digging the All-Purpose cleaner. It’s the only one not pictured here because I finished it before our move from Boston to Atlanta and the empty bottle didn’t survive the trip. Made with rubbing alcohol, water, hydrogen peroxide, pure soap flakes and essential oils this solution arrives in concentration and you “just add water” to the top of the bottle to finalize the solution. My old house had a shower stall tiled with the smallest tiles on Earth = more grout = more cleaning. This solution tackled the challenge with grace – like one of the best recipes I have found at removing grout grime/mold/gunk. I also used this all over the kitchen and on our walls and counters. Loved it. I really liked their scrub too. I found it useful to have on hand when you just need a little more umph. I’ve used it as a boost on our grout and as a sink scrub (A great alternative to Comet). The ingredients are borax, baking soda, salt, natural oxygen bleach, pure soap flakes and essential oils. Check out Truce’s website for more. I’ve tested both of these solutions and they work really good. The Cleansing Water has no smell and is great for counters, grease and grime. And the Disinfectant smells mildly like bleach and made my toilet sparkle. I like the idea of using a mild essential oils + castile soap based cleanser on the daily but I gotta admit, if my kid throws up on the floor I would be relieved to have this disinfectant on hand. 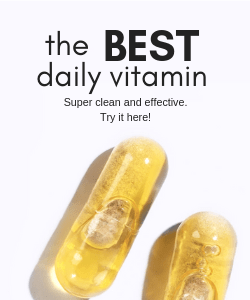 According to their website, it is proven effective against 99.99% of known bacteria and viruses including MRSA, C.diff, E.coli and Salmonella. Dang. 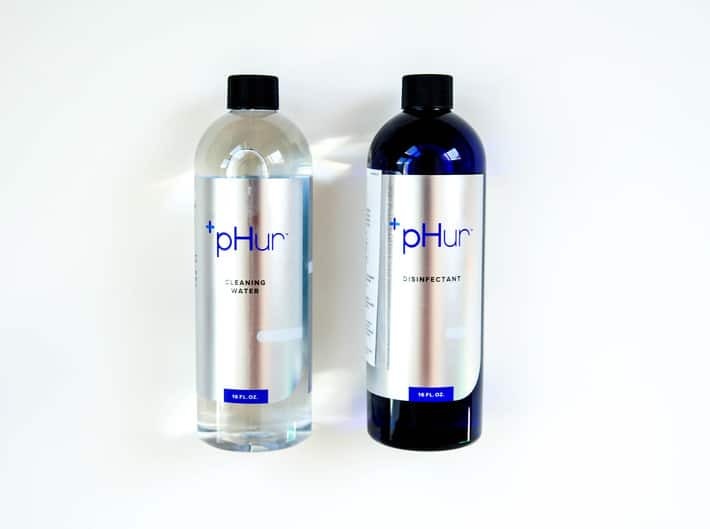 pHurTM Disinfecting Water’s all-natural water + salt formula, but what sets pHur apart, is the scientific stuff, the stabilized, neutral pH. With a pH at just around a 6, bacteria sees pHur as a food source, welcoming it right inside. pHur kills bacteria physically from the inside, it’s not chemically attacking the bacteria from the outside. So, there is zero dwell-time and no wiping or rinsing. pHurTM Cleaning Water is a modified, alkaline water with a pH of 11.
pHur is not watered down bleach…Bleach is Sodium Hypochlorite (NaOCL) and HIGHLY TOXIC. Gimmie The Green Light; Cuz I’m Ready To GO! Stay tuned for some more on The Green Living Green Light series. 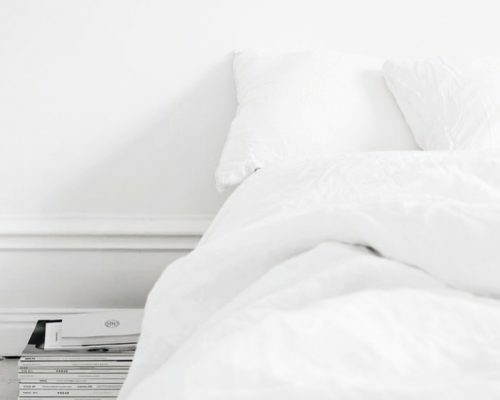 I have a couple of natural living subscription boxes I will be talking about as well as a new mattress that will be delivered any day now! 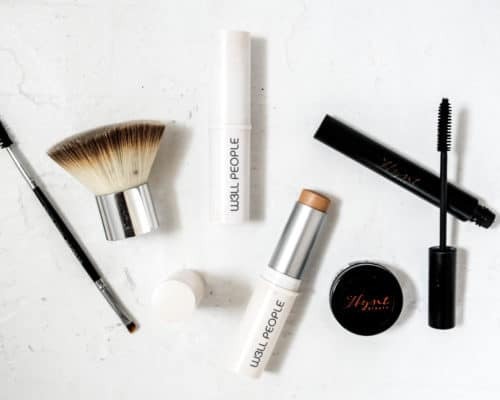 Have you tried any of these goodies? Do you have a green living something you are currently loving? Dish! 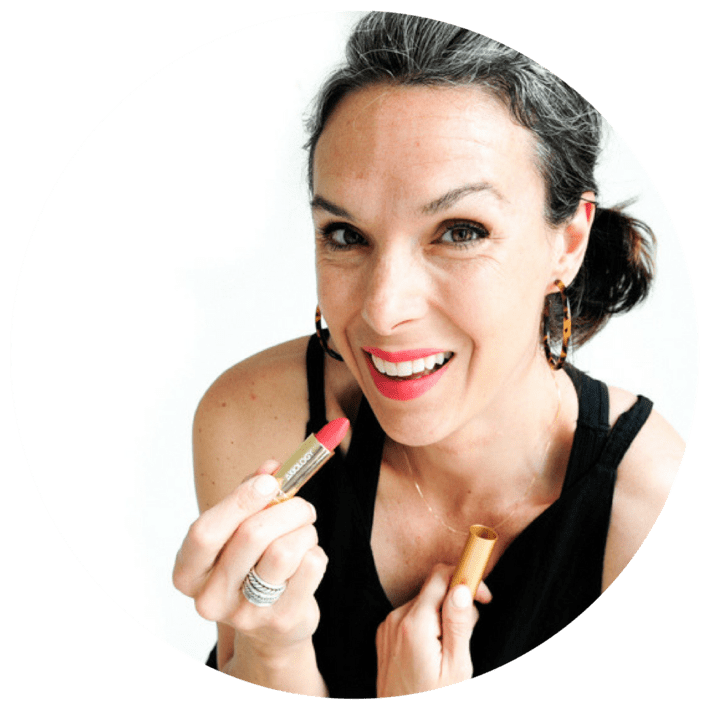 Nontoxic Makeup??? 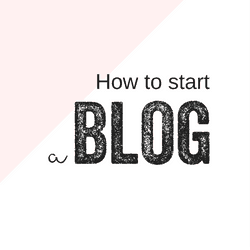 Where To Start! 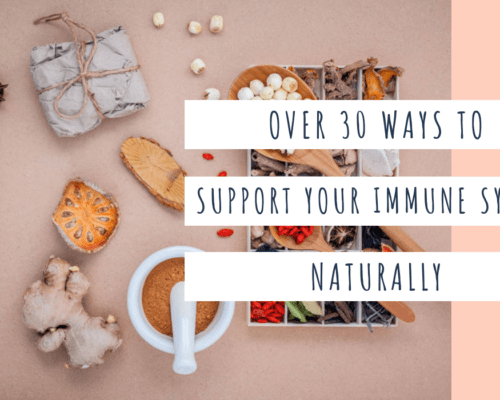 30+ Ways To Support Your Immune System Naturally!